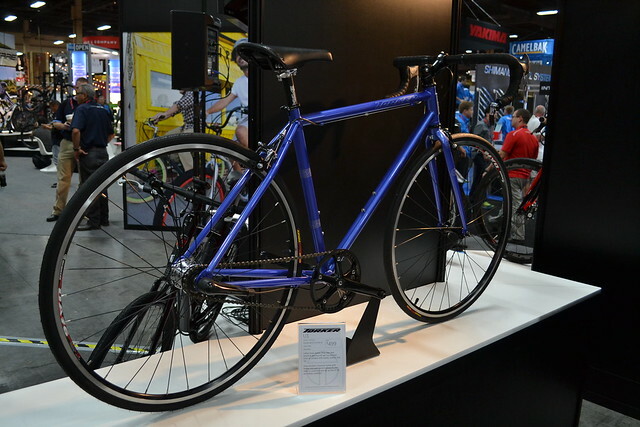 One of our favorite bike brands to deal with is Torker Bicycles. The reason being, they’ve always sent out bikes for testing and they’re really down to earth folks. So here’s their latest offerings for 2014. T800 with Shimano Nexus 8 speed rear hub. It’s also equipped with rack and fenders, read to be ridden. 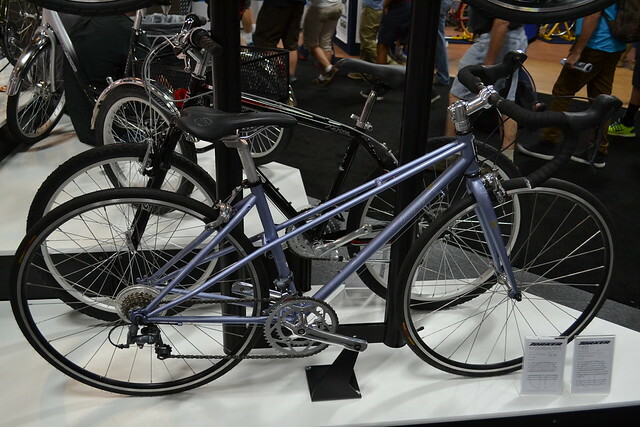 T300 Mixte…so pretty. I’ve always been a fan of Mixte frames. 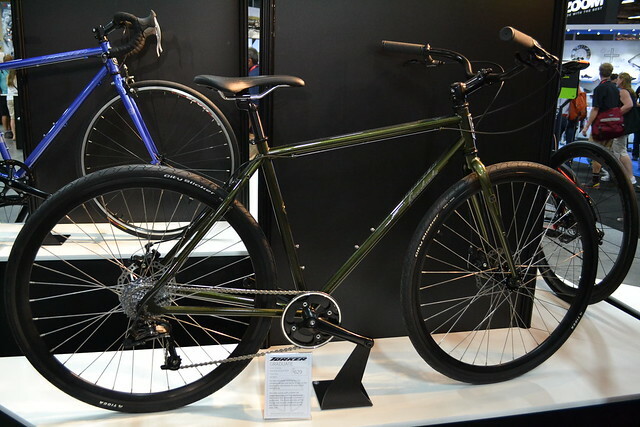 This bike hits the perfect price point that bike commuters are willing to spend on a bike, under $500, $459 to be exact. I was digging the dual top tube design. So what’s this Slidepad Technology? It’s like anti-lock brakes for your bike. Prevents your front wheel from locking up. Read it for yourselves to learn more about it. The Interurban is back for 2013 in a beautuful Rootbeer color. 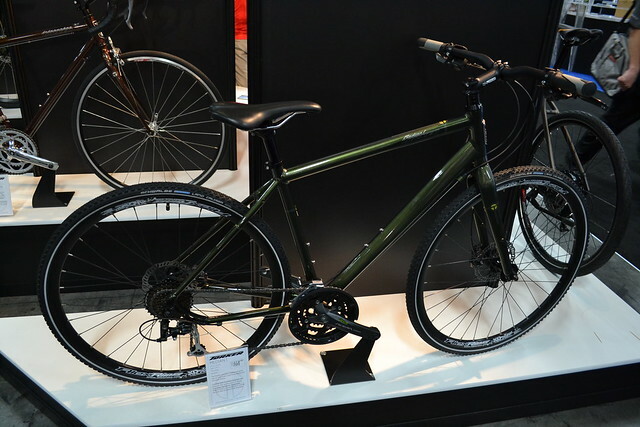 New to their lineup is the Median 1, priced at $649.It has mountain bike style bars with a 27 speed drive train. 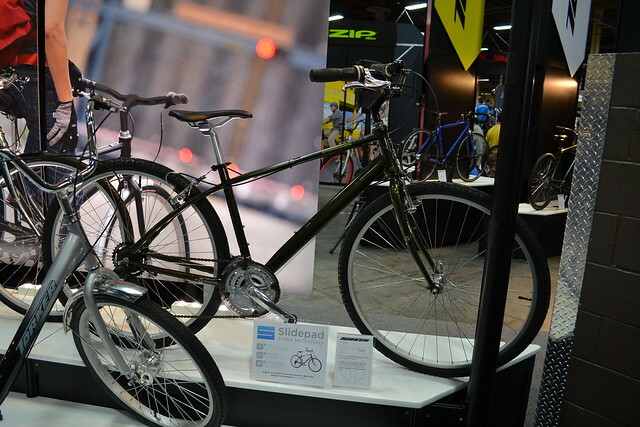 The Graduate, for the sophisticated commuter.This is a simple 1×9 drive train bike priced at $623. The U3 is pretty unique. It’s a road bike-ish commuter with drop bars, and internal 3 speed rear hub. In addition it has fender and rack mounts. Priced at $499. I like the root beer color.The Graduate kinda reminds me of my Monocog, but with gears! What they’ve done with the T300 is terrific. It’s hard to bring in a well-constructed, internally geared bike at under $500, and they’ve still managed fenders, a chainguard, and some style. Impressive. I was coveting MOST of the Torkers on display…I could happily find a home for them in my fleet! What I like best about Torker is that they hit the price points and do it with style. 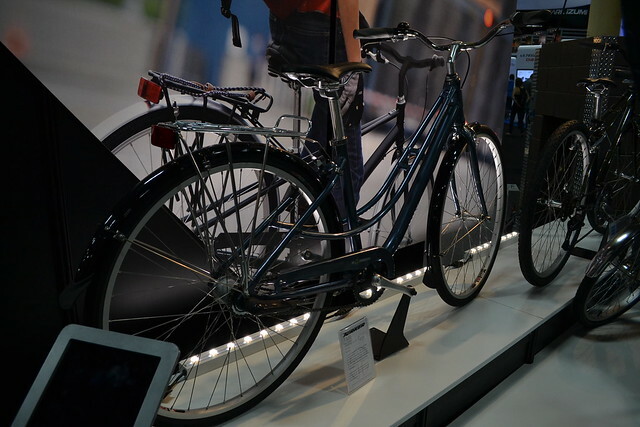 Also, they’re not ashamed about the urban cycling market; too many other companies had their commutery bikes hidden in the back, while Torker had their stuff front and center! 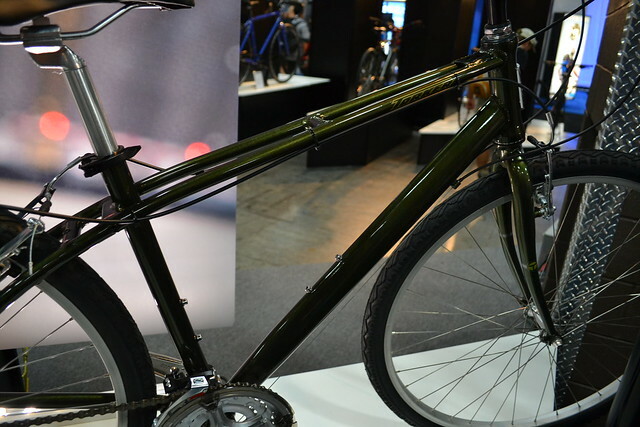 Torker is making some very desirable bikes. The Slidepad technology is interesting. I know lots of riders are fearful of endoing. The Interurban is beautiful. But all my bikes are fairly utilitarian road bike, so I’m biased. 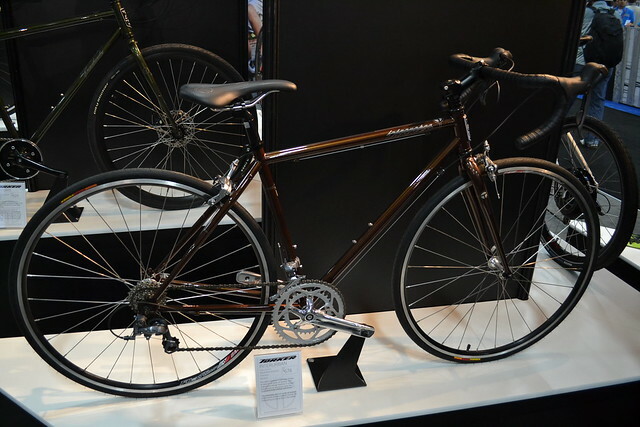 The U3 reminds me of the Schwinn 3 speed I had as my very first nice bike as a kid. It was specced with an upright bar, but dad had the shop swap to a drop bar. I had a rack and fenders(so I’ve always been Fredly). 3 speeds would work quite nicely for cyclists in Florida, as elevation changes are rare. Dammit. I don’t have any room in my collection. Jack—do you know what the bars on the Interurban and U3 are? I know they can’t be Nitto Noodles at that price point, but look at how flat the ramps are. That sure looks like a Noodle, or it’s definitely Noodle-influenced. Best drop bar on the market. Oh goody, yet more technological snake oil that is supposed to take the responsibility of learning how to properly ride a bicycle out of the hands of the rider under the false guise of being “safer”. It’s not comparable to anti-lock brakes in any way shape or form, it in fact reduces the braking power available to the rider. True bicycle ABS could be done (in my opinion) fairly easily given the current sate of tech, but for Slidepad to make the claim of “Front Wheel ABS” is ludicrous. 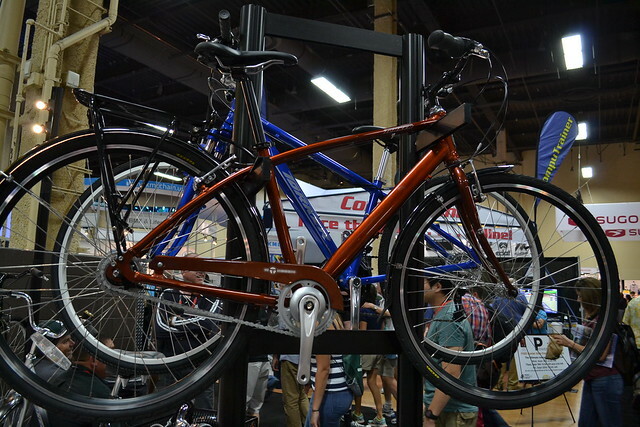 @Mike — the Torker “lookbook” we got at Interbike only has the bars listed as “alloy drop style”. So, a house brand. Everybody’s aping Noodles these days. @Raiyn — take a deep breath, pal. We hear ya. I am hoping the Slidepad folks use “ABS for your front wheel” as a way for people to relate to the concept…but it’s misleading at best. 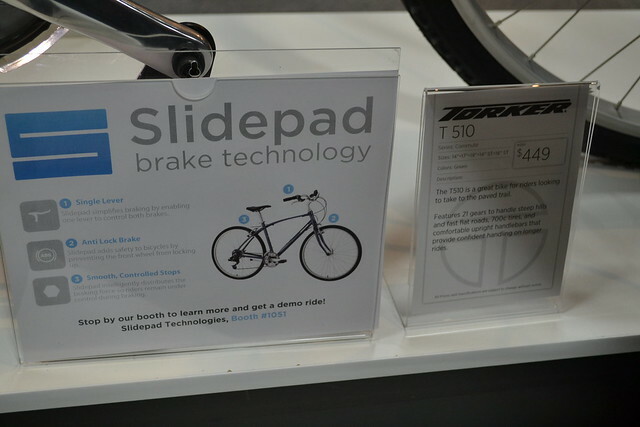 The concept intrigues us enough that we’re trying to get our hands on a Slidepad kit just to see what the deal is. This is about the 4th or 5th anti-front-wheel-lockup system I’ve seen since I started paying attention to such things, and I have yet to hear anything positive about them. It would be more cost-effective for me to rebuild my Fantom Cross Uno with an IGH than to buy a U3, I guess.